This side-entry handicap van conversion comes standard with a powered ramp and several wheelchair positions. The rear-entry Edge provides manual ramp access through the back of the van for the wheelchair user. Supports one wheelchair user. 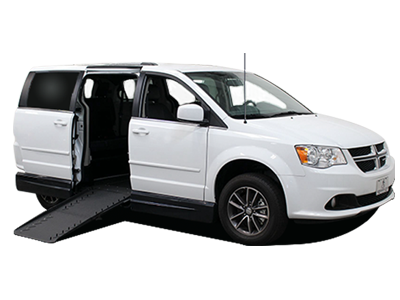 The Dodge Grand Caravan wheelchair-accessible van conversion is the best-selling model of our new and used handicap vans, because it's the ideal blend of features, price, and quality as a handicap-accessible wheelchair van. Features like anti-lock brakes, dual sliding doors, and a V-6 engine make the SE an excellent choice. The SXT model offers even more features. 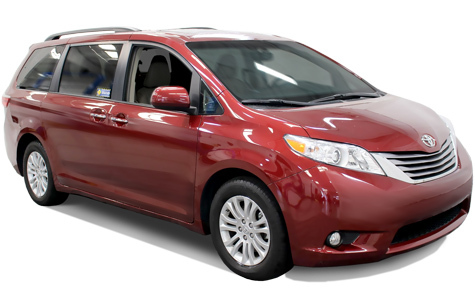 Start with power sliding doors, key-less entry, power windows, locks and mirrors, add traction control, rear heating and air conditioning for three-zone climate control, power driver's seat and a gutsy V-6 engine, and you're riding in one of the best minivans around. AMS Vans wheelchair ramp conversions transform this minivan into a handicap-accessible vehicle with style and power. 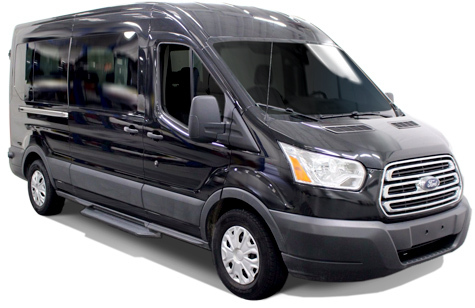 The AMS Vans conversion process has no equal in the mobility industry. 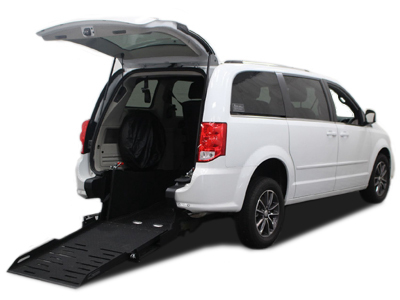 We create a new 10" lowered floor and power-ramp system, which enables the wheelchair user to easily roll into the minivan and park in one of several positions. The innovative design is called a lowered-floor ramp van. Side door and floor lowered 10"
The AMS Vans side-entry conversion is backed with a great warranty serviced nationwide. You can have your AMS Vans wheelchair accessible handicap conversion van before you know it! view all currently available used Dodge wheelchair vans for sale or our collection of new Dodge handicap vans for sale or conversion. Buy, Convert, or Sell Your Van! 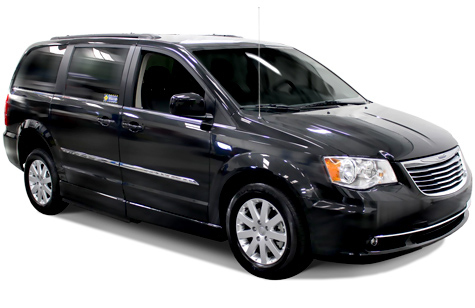 New and used Dodge handicap vans are available nationwide for families and businesses like accessible taxis, nursing homes, medical transport, and more. Find Dodge handicap vans for sale with wheelchair ramps. 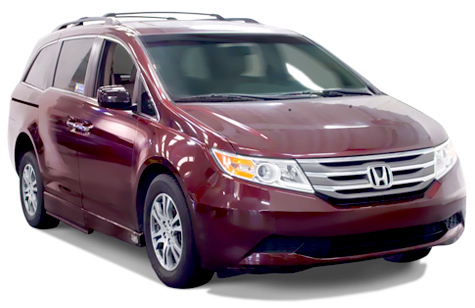 Choose from accessible minivans with new and used conversions in both side and rear entry models. 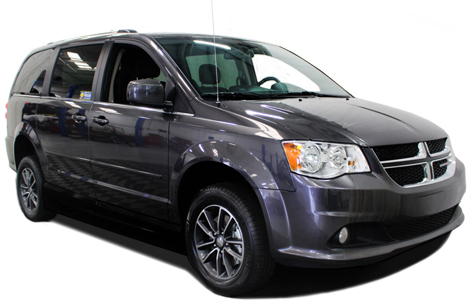 Convert a new or used Dodge minivan to be wheelchair accessible in any of the AMS Vans models. Sell your used Dodge wheelchair van direct to AMS Vans for a great price, quick cash, and free nationwide pick-up. AMS Vans buys late-model, used Dodge minivans for wheelchair van conversions, and we pick them up at your location free of charge! 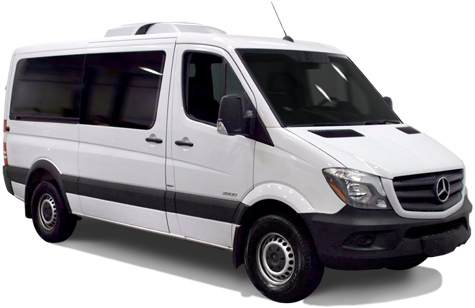 Learn about the options for delivery, service, warranty information, and funding options on the AMS Vans Dodge handicap van conversion for your family or business. AMS Vans wheelchair van conversions do not void the original warranties on the unmodified Original Equipment Manufacturer (OEM) parts. If you are buying a brand new Dodge minivan, you may be qualified to save money on your conversion or additional mobility equipment. Financial assistance for wheelchair vans is available from third-party resources through loans, grants, and other funding sources. We deliver your vehicle right to your door! Our accessible minivans can be parked at your front door in as little as 24 hours, depending on your location.